Clockwise, beginning top left: Photos courtesy of Mark C. Poloncarz, Big Ditch Brewing, Lewiston Police Department, Great Lakes Coffee Roasters and Depew Police. April 1 is the day when we see who's gullible and who's not. And, judging by The News' post about the Giant Inflatable Duck's return to Canalside, most people are quite gullible. Typically serious Buffalo-area businesses take this day every year - April Fools' Day - to concoct a fictional announcement their followers might believe is actually true. Others are so wildly inane that followers can do nothing but laugh, like the first entry, below. Here's what the creative minds of Buffalo businesses and institutions have come up with. What happened: By the nature of their species, cats get left out of the K-9 program at local police departments. But sometimes cost-cutting measures must be taken, and that's where the cats of Lewiston might shine. The Lewiston Police Department joked that they plan to install their Cat Cop Program, led by the noble Mr. Peebles, below, who has donned quite the formal cap. What happened: Two first responders from Depew got in on the funny business, with the police department dropping the more amusing prank. The hybrid pursuit cruiser, which can chase down "bicycles, children's Power Wheels, loose dogs and really fast runners," could reach 30 miles per hour as a max speed, and it would hit 20 miles per hour in less than 30 seconds. This is one powerful vehicle, and we hope Depew uses it responsibly. (OK, fine, it doesn't exist). The fire department, however, announced classes for "underwater apparatus rescue operations," with an accompanying image of a fire truck submerged in a large puddle. What happened: The unmistakable red sails of the Spirit of Buffalo are old news, apparently, as the Spirit of Buffalo announced the city's first floating distillery on Facebook Monday. The three flagship liquors - Loose Knots Vodka, Ship-Faced Cinnamon Whiskey and Drunken Sailor Spiced Rum - are both mildly vulgar and rather witty, and the designs are dynamic. What happened: For popular brands that start in Buffalo and look to franchise, neighboring Rochester is often a city to consider. Popular sub shop Jim's, which already has 10 area locations, announced another franchise at 3450 East Circle Drive in Rochester. Just one problem - the Rochester they lined up was Rochester, Minn., and they're locked into a horrific five-year deal. Catastrophe! Fortunately, none of this is true, but the original Rochester news had some people duped. 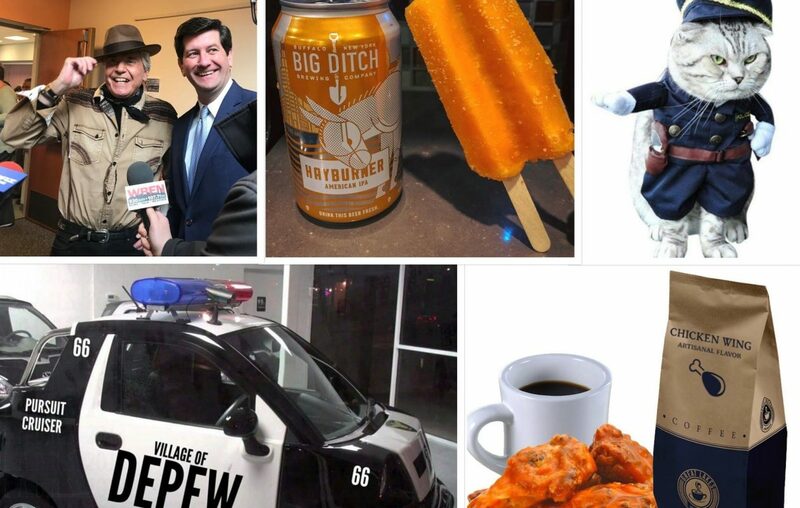 What happened: Claiming to be a huge history buff - and who knows, he could be - Erie County Executive Mark C. Poloncarz issued a three-tweet press release announcing the City had stumbled upon pre-Burning of Buffalo relics in its search for a new Buffalo Niagara Convention Center site. Buried in his release is the name of the guest archaeologist, Henry W. Jones Sr., who happens to hail from "Indiana Jones." Thanks to the sharp eyes of News reporter Sandy Tan, the sub-heading from the release, below, spells out April Fools with the first letter of each word. What happened: Almost every year, a local food-and-drink business chimes in with a specialty chicken wing flavor. In 2019, it's Great Lakes Coffee Roasters, which just opened a location at 123 Stutzman Road in Bowmansville, that has named its specialty flavor for April after the iconic Buffalo food. They even sneaked in a ranch dressing joke! What happened: A vending machine that spits out tightly wrapped Lloyd burritos? What if there were one at University at Buffalo's north campus and at its south campus? And why is the Medical Campus left out? The ingenious idea - albeit a joke - has already surpassed 500 likes on Instagram and, if feasible, would sell out daily. What happened: Following Flying Bison's Rusty Chain, which was virtually omnipresent for the first few years after its release, Big Ditch Brewing Co.'s Hayburner has become the best known local beer. How refreshing would a Hayburner popsicle be, especially if its ABV matched the beverage? Too bad that it's not real. What happened: Fresh from offering a free game of bowling for every Tim Hortons Roll-Up-the-Rim losing cup (this really exists), Manor Lanes, on Grand Island Boulevard in Tonawanda, teased a small blindfolded bowling league to resemble "Bird Box," the mega-popular horror film on Netflix. Naturally, the registration link takes you to an April Fools' page, but the Facebook post did fool at least one person. What happened: Student newspaper the Buffalo State Record is jam-packed with jokes, as its April Fools' Day issue previewed a medical marijuana campus bound for the impound lot at 166 Dart St., Chick-fil-A adding a location in the campus dining hall and a Canadian Football League team moving its home to the school's Coyer Field, and even more content. What happened: Police and fire departments in the area have become known for April Fools' tomfoolery in the past, and Williamsville tried valiantly to join the fun with this swift-water rescue boat that would traverse Ellicott Creek. It's an absolutely brutal Photoshop job, but at least they made the effort. What happened: Kone King's just-announced flavor - rainbow unicorn custard - would likely be quite popular, especially with kids, judging by the initial reactions on the local business' Facebook page. It's a little funny that health nuts were unnerved by the (likely) significant artificial flavors it would take to construct this but, alas, it's not real. Very happy to announce our newest flavor - Rainbow Unicorn custard! What happened: Some people have hair that smells faintly like Labatt Blue already, but the U.S. branch of the brand, headquartered in the Labatt House by KeyBank Center, has rolled out a shampoo and conditioner combination that captures the beer's scent. If this were real, it might actually be fairly popular in Buffalo, despite the potential hoppy dandruff. NEW! Labatt Blue Shampoo. Respect the flow. What happened: Employees from the Buffalo tourism bureau Visit Buffalo Niagara were fooled by a box of Paula's Donuts that contained heaps of celery and carrots, while the Cheektowaga Police Department was delivering Tim Hortons' doughnut boxes filled with fruit and vegetables. Out for delivery!!! Happy April Fools Day!!! What happened: The Buffalo & District Soccer League just topped its Thruway rival, the Rochester & District Soccer League, in a wild play-in game for the USASA Amateur Cup. Barbs were traded on Twitter, and there's no love lost between the two sides, which bodes well for the entertainment value for future clashes. On Twitter Monday, however, the BDSL announced it will merge with the RDSL in 2020. With the RDSL yet to respond, the response has been tame so far. Did we miss something fantastic? Please let us know.